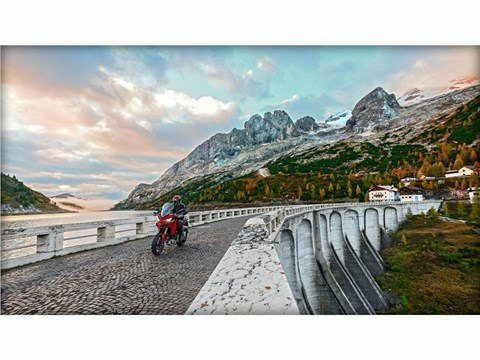 MSRP or Price does not include $890 in destination charges. 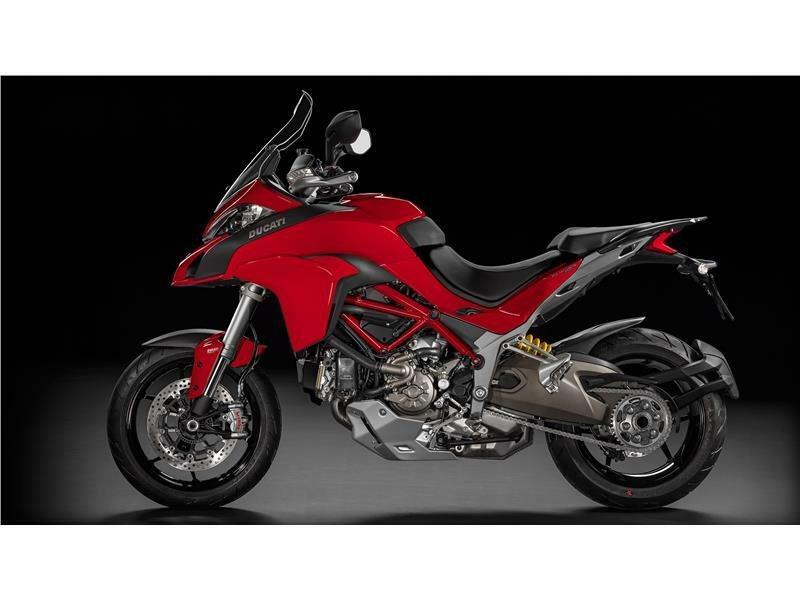 OVERVIEW: The chassis is designed to deliver high overall performance in a wide range of riding situations: the 1.529 mm of wheelbase ensures great abitability and keep the weight of the passenger and side paniers inside the wheelbase length, a considerable contribution to the motorcycle’s dynamic performance; a maximum lean angles of 47° to have fun on back roads; 180 mm of ground clearance makes the bike enjoyable in off-road; the total steering lock angle of 80° combined with a low weight and a perfect weight-balancing (50% front, 50% rear) makes tight maneuvers at low speeds, typical of urban environment, easy to manage. The fuel tank has a capacity of 20 Litres. 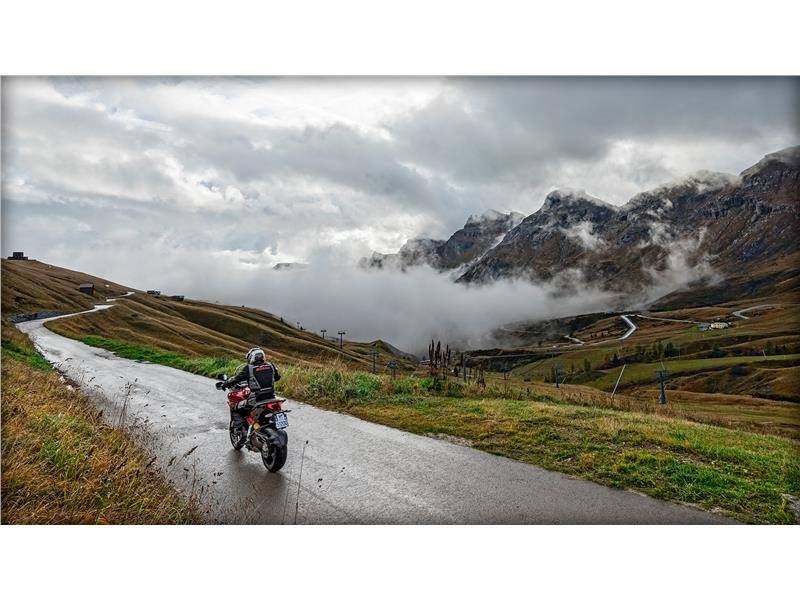 Subject to riding style, the 20 Litres can provide more than 400 km of motorcycle pleasure between fuel stops, measured on homologation riding cycle. Y-PATTERN 3-SPOKE WHEEL RIMS: The sporty attitude of the Monster 1200 is emphasized by its Y-pattern 3-spoke sport rim design in light alloy. The 3.5x17 front wheel and 6x17 rear wheel are fitted, respectively, with 120/70 R and 190/55 R Pirelli Scorpion Trail II tires. PIRELLI SCORPION TRAIL II TIRES: As the first generation the Pirelli Scorpion Trail II is purposely designed for on/off road use to deliver sport performance on the road in terms of grip and lean angles, while ensuring high mileage for touring and good off-road performance. The new tire offers: Greater grip on the edges with light and precise handling, Improved carcass structures for enhanced straight line stability at high speed, Increased maximum mileage on the street, Greater traction on light off-road surfaces thanks to the new central tread pattern and compound. 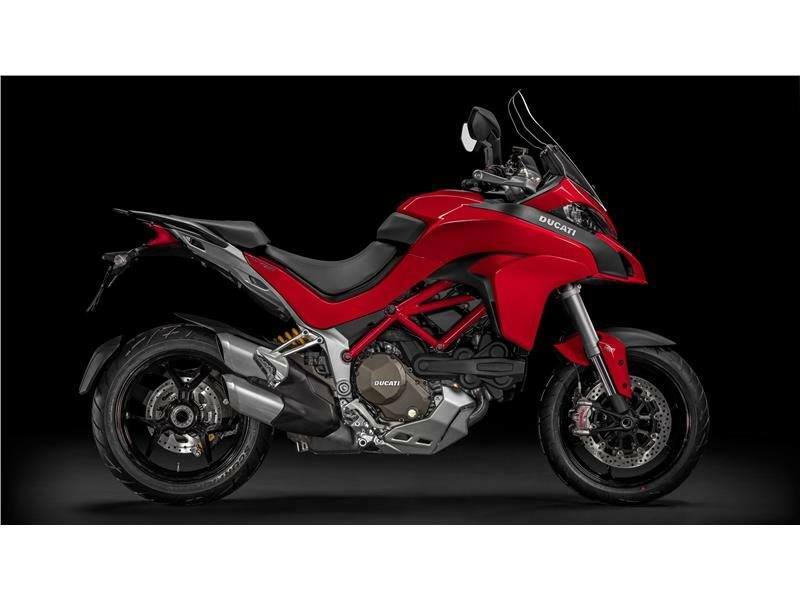 DUCATI SKYHOOK SUSPENSION (DSS) EVO: The Multistrada 1200 S is equipped with Æ 48 mm front fork and Sachs rear monoshock, both integrated with the latest evolution of the Ducati Skyhook Suspension (DSS) system. 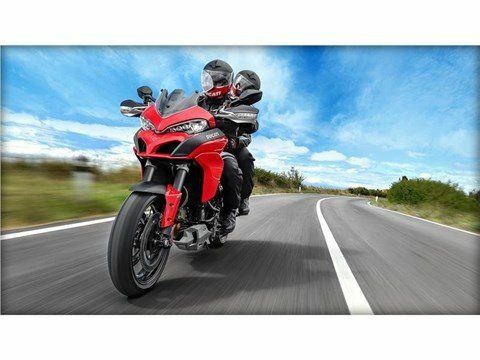 This system is characterised by semi-active suspension control, that automatically and continually adjusts damping to maintain a steady attitude regardless of road conditions, reduce the amount of vibration transferred to rider and passenger, and significantly improves riding comfort and stability. The name "Skyhook" describes the feel of the bike, which seems to be hooked up to the sky and immune to bumpy terrain. The DSS system processes the inputs from a number of sensors (vertical accelerometers and spring travel sensor) located on sprung and unsprung components instantly and adjusts compression and rebound damping according to selected Riding Mode so as to minimise the vertical motion caused by the road and maximise riding comfort and stability. In addition the 2015 DSS system uses pitch angles information provided by the Inertial Measurement Unit (IMU) to adjust damping continually to minimise load transfers during transition from braking to acceleration and deceleration, with great benefits in terms of dynamic performance. Rear suspension spring preload adjustment is integrated with the Riding Modes. The system enables the rider to select the different Riding Modes (Sport, Touring, Urban and Enduro), and to change setup conveniently and quickly to suit load conditions and type of trip: riding solo, rider and luggage, riding two-up or two-up with luggage. The DSS recognises customised settings and re-tunes accordingly before starting interaction. 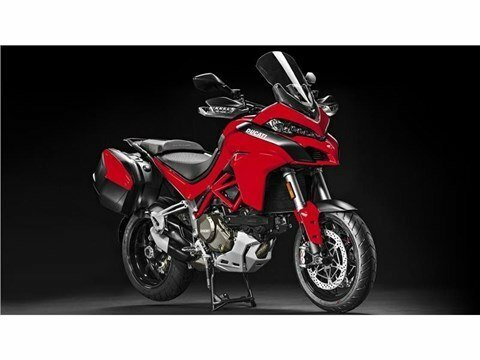 SINGLE-SIDED SWINGARM: The Multistrada 1200 is equipped with a single-sided cast Aluminum swing-arm that ensures high rigidity, low weight, excellent stability, it provides technical and professional look and contributes to deliver superior on-road performance. 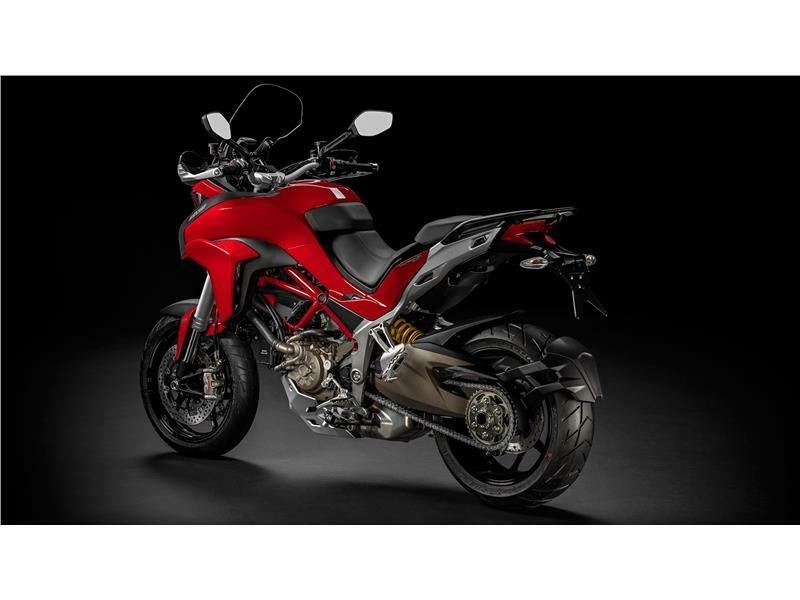 DUCATI TESTASTRETTA DVT: The Multistrada 1200 is powered by the brand-new revolutionary Ducati Testastretta DVT engine which adopts a Desmodromic continuous variable valve timing to optimize power and torque across a wider rpm band delivering an unprecedented combination of breath-taking-torque (132 Nm@7.000 rpm), class-leading power (160 Hp@9.000 rpm) , super-smoothness and low fuel consumption; the Desmodromic Variable Timing (DVT) is a double and continuous system applied for the first time to a motorcycle engine managing both exhaust and intake camshafts. On a conventional engine both the exhaust and intake valves' open or closed position depends on their fixed position relative to the timing-belt that's driven by the crankshaft. The timing cannot be altered, so there's no way to increase or decrease the amount of valve overlap when both valves are open at the same time. As a consequence the time that the valves open and close is really optimized for only one engine speed-range away from those rpm, fixed camshaft timing is the best compromise. 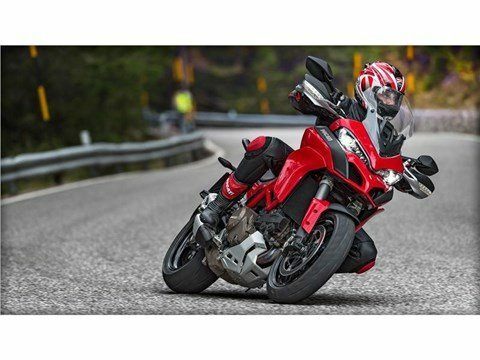 The aim of the Multistrada 1200's engine was to increase power at high engine speeds and also increase torque at low rpm, the only way to achieve this goal was to use a variable valve timing system. The DVT system, has the task of setting the most advantageous valve timing according to engine load and speed requirements; it allows to continuously advance or retard both exhaust and inlet valve timing by rotating the camshafts to operate efficiently at a wider range of speeds by delivering high performance at high speeds, with a flatter torque curve at low speeds. The engine configuration is completed with the secondary-air-system, the dual-sparks injection system where the two plugs are managed independently and the anti-knocking sensor. The combustion process is optimized with high compression pistons (12.5:1). BOSCH 9ME MULTI-CALIBRATION CORNERING ABS: The Multistrada 1200 comes standard with the Ducati Safety Pack (DSP) that combines the Bosh 9ME multi-calibration cornering ABS with the Ducati branded 8-levels DTC. 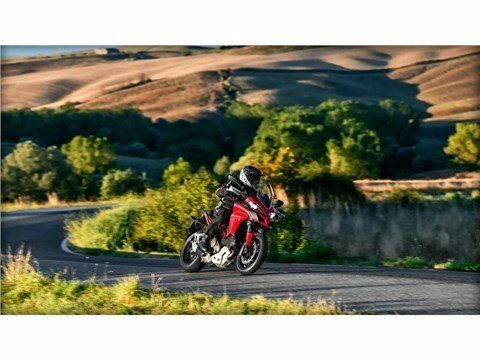 The sophisticated 9ME multi-calibration cornering ABS improves active safety during braking situations while riding straight as well as while cornering without sacrificing dynamic performance or riding fun. The 9ME cornering ABS provides in braking phase top performance and state of the art active safety level with the following customer benefits: Ensures optimum distribution of brake force at all times preventing front and rear wheels from locking; Revents the rear wheel from lifting uncontrollably when braking; Reduces the risk of "lowsiders" by limiting the maximum brake force. 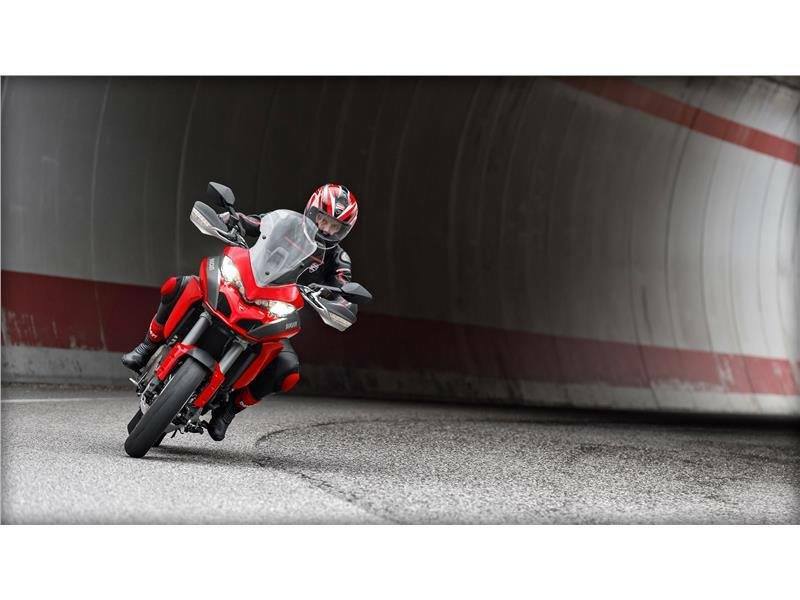 It distributes the maximum available brake force between the wheels, ensuring the best possible brake performance under cornering conditions; When braking heavily in curves the ABS, reduces the motorcycle's tendency to return to an upright position leaving the desired lane. The combined brake system function creates the best possible distribution of brake force between the wheels, and thus stabilizes the bike during cornering; Possibility to switch from a calibration configuration to another by selecting the appropriate Riding Mode; Of course ABS can be deactivated if rider wishes. ABS-Off can be loaded as a configuration of a riding mode and is maintained switching after key-off. 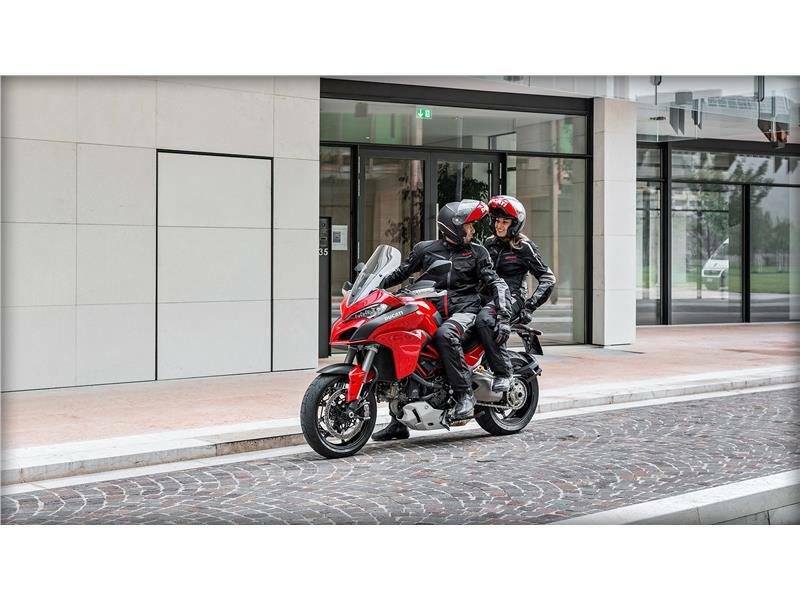 INERTIAL PLATFORM: The Multistrada 1200 is equipped with the latest evolution of Inertial Measurement Unit (IMU) by Bosh that provides the information used to deliver a significantly greater level of safety and riding control, of course without sacrificing riding pleasure and performance. The sensor measures the 5D inertial signals, roll rate (OX), yaw rate (OZ), longitudinal acceleration (aX), transverse acceleration (aY) and vertical acceleration (aZ) of the motorcycle; an algorithm uses these values, provided via CAN, (and other data such as wheel speeds and other motorcycle-specific parameters) to determine the lean and pitch angles. The lean and pitch angles are provided by the IMU to 9ME cornering ABS, Ducati Wheelie Control (DWC), Ducati Skyhook Suspension (DSS), and Ducati Cornering Lights (DCL). DUCATI CONRNERING LIGHTS (DCL): The Inertial Measurement Unit (IMU) constantly supplies lean angle data to the Ducati Cornering Lights (DCL) that equip the Multistrada 1200 S to provide a greater active safety at night or whenever visibility is poor. When entering a bend, the dedicated LED located in the headlights turn on in the direction of the road, according to a defined lean angle, allowing to see around the corner instead of having to ride into darkness. When the lean angle sensor detects the bike is bending the LED are turned on and the illumination is directed into the bend to balance the angle of lean and as consequence to become any obstacles visible sooner. DUCATI TRACTION CONTROL (DTC): An integral part of the Ducati Safety Pack (DSP), the Ducati Traction Control system can be adjusted to eight levels (four of which are integrated in the Riding Modes). It processes the inputs from the wheel speed sensors to control rear wheel slip, significantly improving performance and active safety. The system installed on the Multistrada 1200 offers a very smooth intervention of the system, which gives priority to ignition delay. In case of wheel-spin, the system reacts by delaying the ignition, up to a 60% torque reduction request. For higher torque reduction requests the injection is cut off. Each pre-set DTC level associated with the different Riding Modes can be customised by the rider and stored from the setup menu. DUCATI WHEELIE CONTROL (DWC): The Ducati Wheelie Control (DWC) algorithm is computed by the BBS (BlackBoxSystem unit) and it uses wheels speed, roll and pitch angle (provided by Bosch IMU), longitudinal acceleration signals. The DWC control algorithm uses those signals to determine the status of the bike and the magnitude of the wheelie as a consequence of that the system allows maximum acceleration in a safe manner. Based on these information the DWC control unit computes a power/torque request which is sent on CAN to the ECU (Engine Control Unit). The ECU interprets the data communicated by the DWC control unit to reduce the power/torque level required by the rider. The power/torque reduction is shown by the DTC light on the dashboard. Depending on the DWC level, ranging from 1 to 8, there are different reductions of engine power/torque compared with the same motorcycle dynamic conditions. In particular the power reduction is lower with level 1 and higher with level 8. 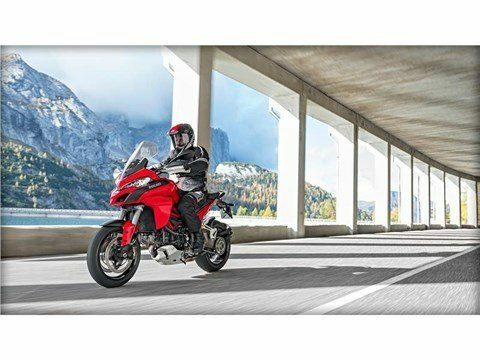 CRUISE CONTROL: The Multistrada 1200 comes standard with an electronic cruise control function making lengthy motorway rides more relaxed and comfortable. The function is activated by pressing a dedicated easy-to-access button at the left-hand end of the handlebars, via the same button is possible to increase or reduce the currently selected road speed. Here the two throttle valves are activated by the engine control and independently of the accelerator twist grip. When the front or rear brake or the clutch are activated or the throttle grip is turned in the opposite direction cruise control is switched off. The “Resume” function allows the rider to re-activate the originally selected speed, which the vehicle then automatically restores. Front - Y-shaped 3-spoke in light alloy, 3.5 x 17 in. Rear - Y-shaped 3-spoke in light alloy, 6 x 17 in.